Going Through Photos & Sharing a Few ! I had the most beautiful gardens at our farm in St. Antoine de Tilly, Quebec (Canada). My niece and I are updating my blog, so I’ve been going through photos and decided to share some photos of my gardens – plus a few others – with you. Below – my biggest garden out of three. The entire garden was about 50 feet long. (There was a vegetable garden at the far end.) How I wish I could’ve brought the gardens with me when I moved to ‘My Yellow Farmhouse’ here in Western Massachusetts! Interesting fact, I laid out the two paths by using a garden hose, since I wanted the paths to curve. PS That’s not our barn – it was our neighbors. 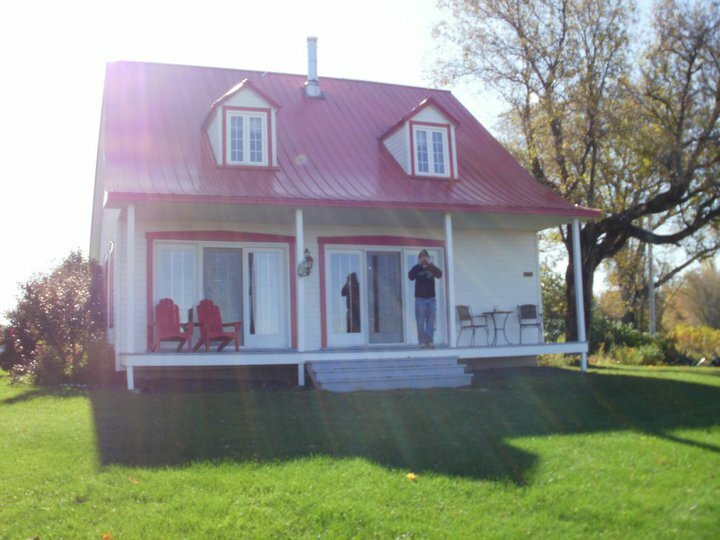 Our barn, as well as our other buildings, was constructed of wood and painted white with a red roof, which is so “Quebecois”!! That’s not our barn but, rather, our neighbor’s barn. 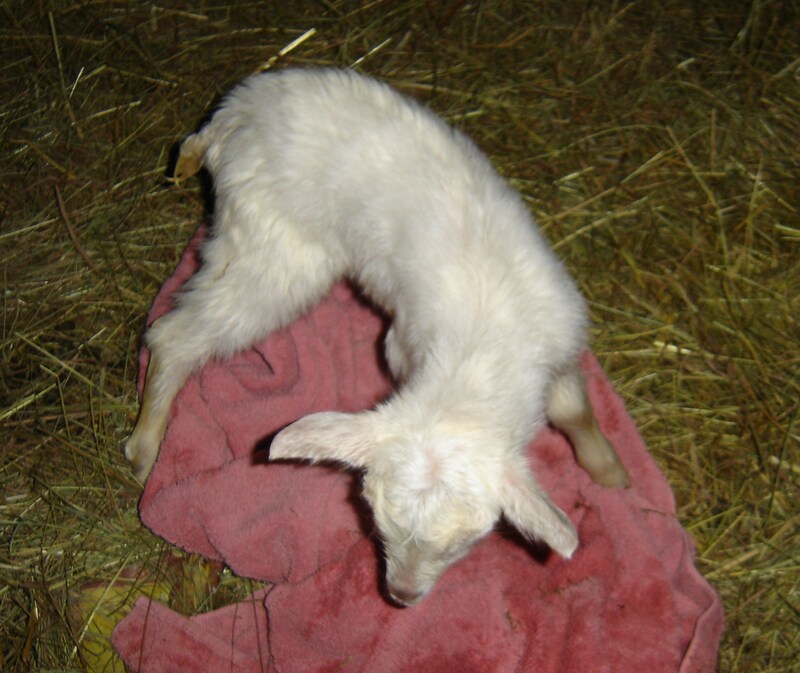 Our adorable twin goats, Fairy & Oberon, arrived rather late at night but, luckily, not so late that we were in bed. I got so nervous after the birth of Fairy that I had to go in the house to get a rum & coke. My husband said, “I think there’s another one coming” but I didn’t believe him. When I returned to the barn, there was my little Oberon. My husband said Oberon really hit the barn floor hard as he was being delivered, and that’s why he was having trouble standing up. Ever intrepid, the next morning I put a tiny splint on Oberon’s leg because, without some help, he wouldn’t have been able to nurse. PS Did you get my ‘Mid-Summer Night’s Dream’ reference in the names I chose? Here’s little Fairy – just moments after being born. I had just finished drying her off – Oberon was not yet born. And here we have both Fairy and Oberon. I just love goats !! This photo could be named ‘Big Boat’. Huge ocean-going cargo ships passed our farm both day and night. My husband headed an international merchant bank, so we had books with information about the ships – if we chose to know their country of origin. We had a system’ of sorts – whoever saw a ship first would yell out BIG BOAT, then we’d all go look!! We were really lucky to have our farm perched on a hill. 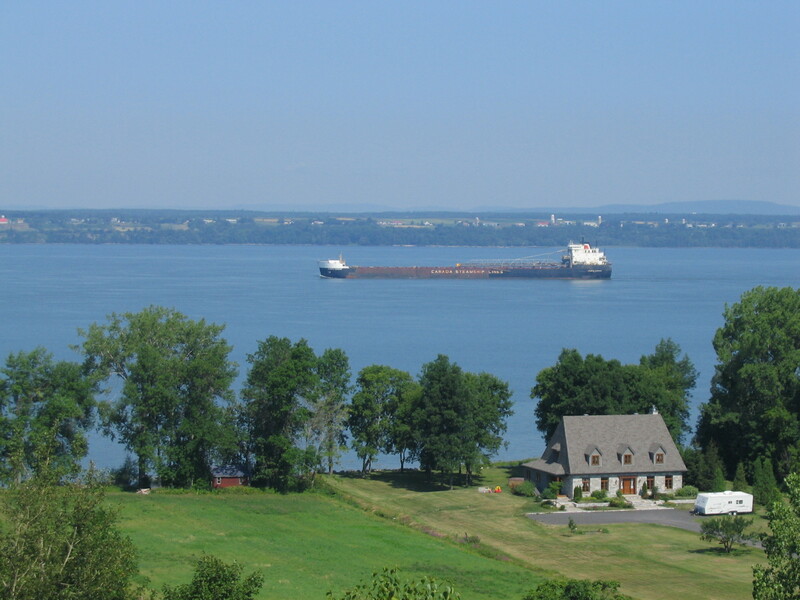 Most of the land along the St. Lawrence river is flat. PS Both the ship and the stone home below were huge, although they don’t seem to be in this photo. Our horse Ben was old & stubborn, but we loved him. The villagers, I’m sure, thought we were strange because we (meaning me) treated Ben a bit like a pet dog. 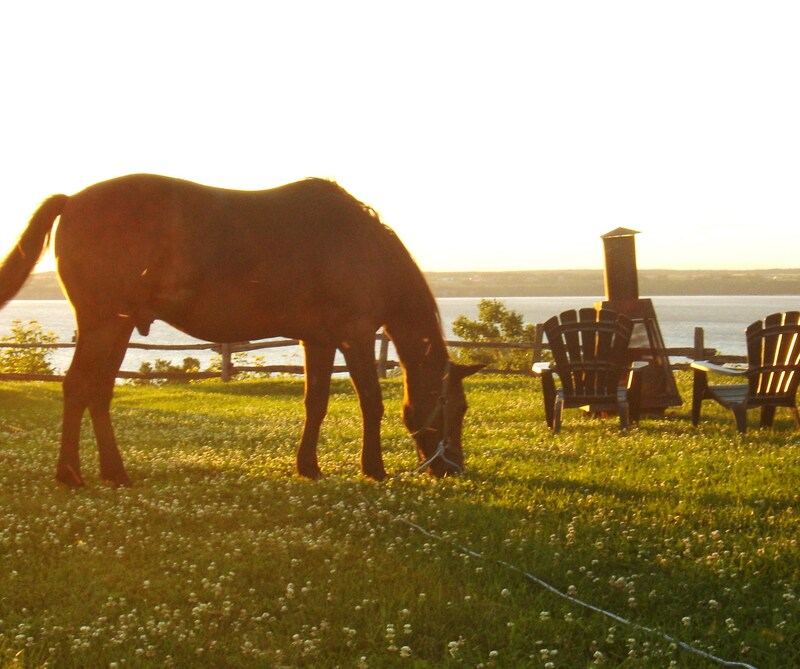 You should’ve seen a neighbor’s face when he visited and saw our horse munching away on grass…. about 15 feet from the house. My husband always said I babied Ben. I couldn’t help it… it’s my nature! I took this photo close to twilight. On the left is our ‘fire thingy’. My husband often started a fire hours before dark because he liked it ROARING HOT while he watched the sun set over the St. Lawrence River. 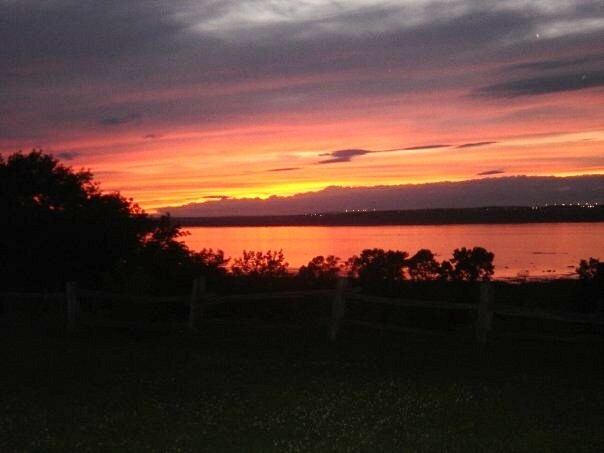 My husband had always wanted a farmhouse facing west, with a view of the St. Lawrence and a view of the sunsets. We were so happy when we found exactly what he wanted – in the village he’d always loved! And the sunsets in St. Antoine de Tilly are gorgeous! Summer days are long in Quebec – but you pay for it in the winter when the sun sets at about 3:45! I hope you enjoyed your visit to our farm in Quebec. During this cold, cold, cold weather, it’s nice to see photos of green grass and blue skies… and flowers!! Thanks Liz – such great memories!! And now I have my cute yellow farmhouse in Massachusetts to love! You’re right Ann. You know what’s funny – I had named the mother after one of the characters in the play… and that’s why I named the babies after characters in the play.. but now I can’t remember exactly what I had called the mother. And Fairy was, in fact, a female – although she could’ve been either. Excellent comment Ann – thanks!